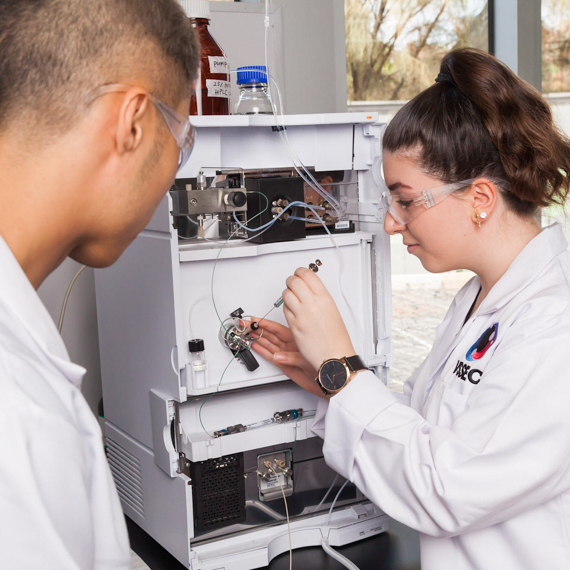 Students undertake a major laboratory program at school and practical application at VSSEC where they use the Infrared Spectrometer, the UV-Visible Spectrometer and the High Performance Liquid Chromatograph. This program assumes that the synthesis and purification of acetyl salicylic acid has been undertaken by the visiting school. VSSEC can offer resources for melting point determination if necessary or will supply commercially prepared acetyl salicylic acid. Experiment 1: The synthesis of acetyl salicylic acid: students synthesise aspirin in their school lab. Experiment 2: The purification of acetyl salicylic acid: students use recrystallization to purify their sample, testing the purity using a ferric chloride test and melting point determination in their school lab or at VSSEC. Experiment 3: Infrared spectral analysis of analgesics: students use FTIR spectroscopy to analyse their aspirin sample and determine the extent of the conversion from salicylic acid to acetylsalicylic. Experiment 4: Analysis of analgesics by ultraviolet/visible spectroscopy; students analyse aspirin tablets using UV-Visible spectroscopy to determine their ASA content. Experiment 5: Analysis of analgesics by high performance liquid chromatography; students determine the concentration of ASA and paracetamol in analgesic tablets using High Performance Liquid Chromatography. NOTE: SMALL class groups may possibly be accommodated even though date is blocked. Please contact us. 1 class, full-day, maximum 18 students. All equipment, workbooks, reagents and materials used during the program. This program assumes that the synthesis and purification of acetyl salicylic acid has been undertaken by the visiting school. VSSEC can offer resources for melting point determination if necessary or be able to supply commercially prepared acetyl salicylic acid.